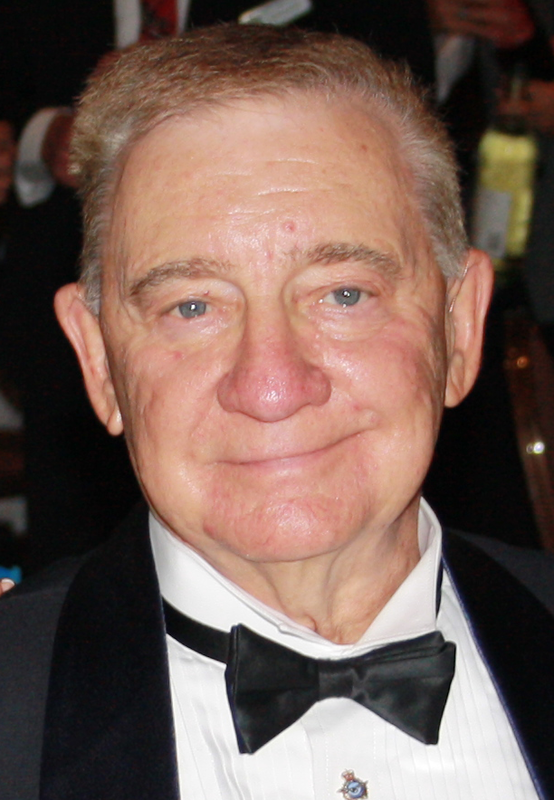 It is with great sadness that we announce the passing of Stan Horton, a past Chairman and Lifetime Director of the British Columbia provincial committee. Stan had been involved with the Air Cadets since his eldest son joined in 1968. His hard work and dedication will be greatly missed. Our thoughts and prayers are with his family. Please note the National Office of the Air Cadet League of Canada will be closed Monday, November 12 and Monday, November 19. REMINDER: DEADLINE FOR PTAA AND MUSIC AWARDS APPROACHING! Reminder: You have until October 31st to apply for the PTAA Flying and Music awards! Apply now! OTTAWA, ON (October 23, 2018) – The Air Cadet League of Canada (ACL) is proud to announce that Her Excellency the Right Honourable Julie Payette, Governor General of Canada, has accepted our request to become our viceregal patron. The Governor General plays a key role in promoting national identity by supporting and promoting Canadian values, diversity, inclusion, culture and knowledge. As such, the Governor General supports associations and organizations for their outstanding contributions to society. According to Rideau Hall, the granting of viceregal patronage is a longstanding practice. Building on the viceregal tradition, support through patronage is aimed at recognizing exceptional contributions to Canadian society, bringing special attention to worthy causes and showcasing excellence. The Air Cadet League of Canada is a civilian non-profit community based and volunteer led organization, which in collaboration with the Department of National Defence and our other partners, is dedicated to supporting the objectives of the Royal Canadian Air Cadet program, and to developing in youth the attributes of good citizenship and leadership; promoting physical fitness; and stimulating the interest of youth in the aviation and aerospace industry, including the air element of the Canadian Forces. 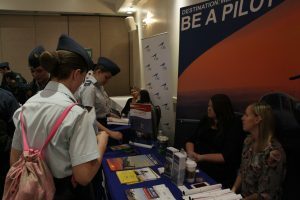 Over 500 Cadets,officers, parents and members of the public attended the Triple AAA Career Expo held in Ottawa on October 14. The focus was on careers, education and employment in Aviation and Aerospace and attendees were treated to 28 Exhibitor booths, special presentations throughout the day, and the chance to speak directly with industry leaders and educators about future career opportunities. The Air Cadet League thanks the many partners, sponsors and exhibitors who made this event successful. Stay tuned to the Air Cadet League for details on future Expo’s being planned. 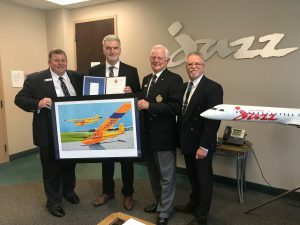 The Air Cadet League of Canada was honoured to present a Certificate of Recognition to one of this year’s recipients, Steve Linthwaite, VP Flight Operations at Jazz Aviation. Steve has been an outstanding supporter, advocate and ambassador for the Air Cadet program, and was the key mover to establish 2 new bursaries from Jazz in the past year. In addition, Jazz has been a strong leader and supporter working with the Air Cadet League and our industry partners on new projects, from being a premier sponsor for the Career Expos to looking at new initiatives for Air Cadets in training, education and career programs. Pictured at a recent presentation at Jazz Aviation Head Office of the certificate and the new 233 Glider print that was awarded to Steve and Jazz Aviation. L to R: Don Berrill (Immediate Past Chair), Steve Linthwaite of Jazz, Jerry Elias (Governor) and Scott Lawson (Business & Corporate Development). A unique opportunity to build your personal legacy while helping to create tomorrow’s leaders. Choose a membership and gift package that will help create your lasting legacy…it’s time to build! It is with great sadness that we announce the passing of Earl Lantz CD, a past chairman and long serving member of the Nova Scotia provincial committee. Earl had been involved with the Air Cadets since becoming one at the age of thirteen. His hard work and dedication will be missed by the League and the committees on which he served. Our thoughts and prayers are with his family. OTTAWA, ON (June 28, 2018) – The Air Cadet League of Canada (ACL) recently elected Mr. C. Mervin Ozirny, CD, from Melville, SK, to the position of National President at their 77th Annual General Meeting held on June 16th, 2018, in Laval, Quebec. Mr. Ozirny, in his presidential message to League members and guests, thanked the members of the National Executive, the Board of Governors, the Provincial Chairs Committee, and the Advisory Council who so generously give of their time and talents in support of the 27,000 Air Cadets across Canada. Mr. Ozirny was an Air Cadet for 4 years with 17 Yorkton Royal Canadian Air Cadet Squadron in Yorkton, Saskatchewan. 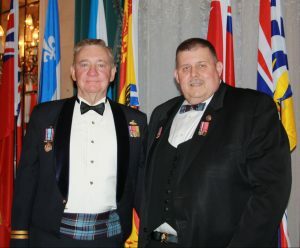 He received his commission from the Canadian Armed Forces in 1985 and served as an officer for more than 21 years, during which time he served in various officer positions, including Commanding Officer of 752 Ed Campbell Squadron and 633 Kamsack Squadron. He retired with the rank of Captain. He worked as a tow plane pilot in the Saskatchewan Air Cadet Gliding Program and at the Gimli Gliding Center, as well as being the Flight Safety Officer for the Saskatchewan Gliding Program. He served as a Regional Director and then, President of the Air Cadet League of Canada (Saskatchewan) from 2010 to 2012. He was then elected to the National Board of Governors in 2013 and was subsequently elected Vice-President and member of the National Executive Committee in 2015. Mr. Ozirny is a recipient of the Canadian Forces Decoration, the Saskatchewan Centennial Medal, Her Majesty the Queen’s Diamond Jubilee Medal, the Air Cadet League of Canada Volunteer Long Service Medal, and two Detachment Commander’s Commendations of Merit. The Air Cadet League of Canada is hiring! We are looking for a summer student to join us as an Administrative Assistant from July to August. For more details including how to apply, please consult the following document.